2018 SYEP Application are now available! SYEP also provides workshops on job readiness, career exploration, financial literacy, and opportunities to continue education and social growth. Programs are located in community-based organizations in all five boroughs of New York City. Youth can apply for the program online or at community-based organizations during the application period. Participants are selected by lottery for the program. Apply here for the program. Black History Month is an annual celebration of achievements by African Americans, and throughout the month, DYCD is recognizing some of the amazing individuals and the roles they played in our history. Click here throughout the month to see our Facebook album with all our great features. What Does Identifying as Afro-Latina Really Mean? "Racial identity for a lot of U.S. born Latinos is a very complex, multi-dimensional, and multi-faceted thing. As a Dominican-American woman born and raised in Queens, New York, I can attest to that. All I have to do is take a good look in the mirror...." Read Johanna Ferreira, full article on HipLatina official website. R & B singer and actress Mary J. Blige made history this month becoming the first black woman to have two Oscar nominations in a single year for Best Supporting Actress and Best Original Song. Ms. Blige appears in the Netflix film “Mudbound”; she also wrote and recorded a song for the film. On her birthday, January 12, 2018, Mary was honored for her music career and received a Hollywood’s Walk of Fame Star. Mary J. Blige’s message to her fans is to believe in yourself and to always try and spread love. CAT provides interactive drama programs for students, their teachers and parents. CAT’s programs motivate 15,000 + young people annually to examine social issues and curricular themes pertinent to our society, such as literacy, anti-bullying, health and wellness, and college and workplace readiness. Visit their website for enrollment information. Use your imagination and become the superhero, or perhaps supervillain, you've always wanted to be. Would you live a life in a comic book universe or use your powers here in the real world? We want to know how you would use your super powers for good, or bad, even if it was just for the day. Submit an online written response to the question: "Which superhero or villain would you want to change places with for a day and why?" (250 words or less).The Superpower Scholarship winner will be notified by email or phone on or around June 30, 2018. Visit website for eligibility requirements and application info. School can get expensive, so consider how winning a $3,000 All About Education Scholarship could help make a difference in your life. Will it ease the burden of student loans? Will it offer you the opportunity to pursue a dream? Will it help you inspire others to work towards their own goals? Education can truly change a person's life – and this scholarship just might be that first step. Answer, "How will a $3,000 scholarship for education make a difference in your life?" in 250 words or less. Applicants must be 13 years or older and be currently enrolled (or enroll no later than the fall of 2022) in an accredited post-secondary institution of higher education. Visit website for eligibility requirements and application info. Let’s Get Ready provides free SAT preparation, admission counseling, and post-enrollment mentoring to students from low-income backgrounds and first-generation-to-college students to help them get into and graduate from college. The program is provided at no cost to high school seniors and juniors with qualifying financial need. Visit their website to apply in any of their New York City locations. The CUNY Fatherhood Academy (CFA) is a free program designed to promote responsible parenting and economic stability for unemployed and underemployed fathers ages 18-28, through education, employment, and personal development. The program provides a range of academic and personal supports including TASC (High School Equivalency test) preparation classes, tutoring, individualized counseling, parenting seminars, MTA Metrocards, and job preparation. Visit their website for enrollment information. The “Made in NY” Production Assistant (PA) Training Program is a free skills training program that serves low-income New Yorkers with barriers to employment and leads to jobs in the dynamic New York City film and television industry. The training course is five weeks long, full-time, with homework and occasional evening sessions. Following the training course, participants receive two years of job placement assistance, career counseling and support as they work their way up the ladder. Visit their website to attend the next information session. Have a story to tell? How about expressing your thoughts through a movie, song or animation of your own creation? RECYouth is a multimedia extracurricular program where you’ll learn video and audio production, photography, and graphic design while encouraging your creative expression. RECYouth is free and open to all New York City teens who meet the following criteria: Age 14-17 at start of program; Recreation Center member (membership is free to youth 17 and under); committed to length of program; interested in multimedia, arts or digital technology; able to work independently and in a group. Applications accepted on a rolling basis, however early registration is encouraged. Please email recyouth@parks.nyc.gov or call (212) 255-3066 for a current RECYouth class schedule and to request an application. 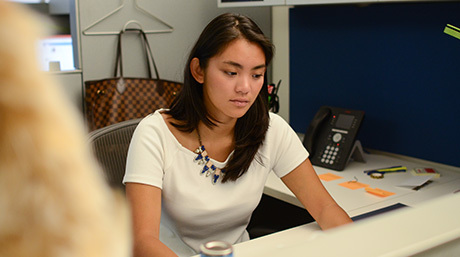 DDC’s Summer Internship Program is an opportunity for a select group of students to gain valuable experience in the architecture, engineering, design, and construction management professions within a public service context. Students will gain hands-on technical experience through specific field assignments and a mentoring relationship with senior-level technical staff. They will also have the opportunity, through a combination of seminars, site visits, and training on the job opportunities, to learn about the challenges of upgrading and constructing the City’s public buildings and street infrastructure. The Thurgood Marshall Summer Law Internship Program places high-achieving inner-city high school students with legal employers for the summer. This Program is part of the New York City Bar’s continuing efforts to enhance the diversity of the legal profession. Applications & parental consent forms for summer 2018 are due on February 23, 2018. Follow @NYCYOUTH on Instagram for updates! Also explore #NYCYOUTH to discover more in NYC. Invite DYCD Youth Connect to attend, present or hand out materials at your event.